The Arctic shelf is the richest region of the world by overall volumes of oil and gas resources. However, countries of the Arctic basin have progressed unequally in developing them. In this article, the authors suggest that the diverging result of these countries in many ways depends on the structure of their oil and gas sectors. This article provides a comparative analysis of privately and state-owned companies’ participation in Arctic projects for those countries that are at the stage of commercial production on the Arctic shelf, namely the US, Norway and Russia. An analysis of oil companies’ performance indicators allows us to conclude that private companies are more efficient at developing the region than state-owned ones. Today, not all countries of the Arctic basin are developing their sectors of the shelf beyond the Arctic Circle. Some countries are at the initial stage (geological exploration), which demands a significantly lesser amount of investments in comparison with commercial production. A number of studies over the last several years have been dedicated to the development of hydrocarbon resources in the Arctic region (e.g. Henderson and Loe, 2015; Kryukov, 2015; Conley et al., 2013; Bogoyavlensky, 2012; Lindholt and Glomsrod, 2011; Harsem et al., 2011; Kosenkova and Ananyev, 2010; Langhelle et al., 2008; ExxonMobil study, 2013; Wilson Center publication, 2014). These studies analyse various aspects of Arctic exploration, such as economic potential of oil and gas reserves, geopolitics or environmental issues. In this article we examine developments in the Arctic shelf from a specific angle: we try to answer the question what role does the structure of the hydrocarbon sector play in determining the pace of mineral exploration. More specifically, we examine the role of governments in managing and regulating hydrocarbon exploration and production on the Arctic shelf. We then compare how that translates into the progress made by each Arctic littoral state. The role of private and state companies is already well researched in some ways and barely examined in others. The success and failure of countries in the development of the Arctic is in many ways founded in the structure of their oil and gas sectors. It is important to understand how the difference in these structures leads to different performance results. Further production on the Arctic shelf will depend largely on shifts in oil prices (Harsem et al., 2011). The oil price drop (it halved between June 2014 and May 2015) led to a decreased investment programmes in the Arctic. Nevertheless, this region remains the main cradle of hydrocarbons in the world. According to the US Geological Survey estimates, it holds roughly one fifth (22%) of all global technically recoverable oil and gas resources, which are located predominantly on the Arctic shelf (Bird et al., 2008). Five countries have direct access to the Arctic shelf: the US, Canada, Norway, Russia and Denmark (Greenland), but only three of them have current production in the region. Arctic resources are divided very unequally. Most oil and gas resources belong to Russia: 41% of all undiscovered technically recoverable resources of oil and 70% of gas. Despite Russia’s huge resource potential, the US is the leader in oil production on the Arctic shelf, and Norway is the leader in gas production (Fig. 1.1 and 1.2). Figure 1.1. 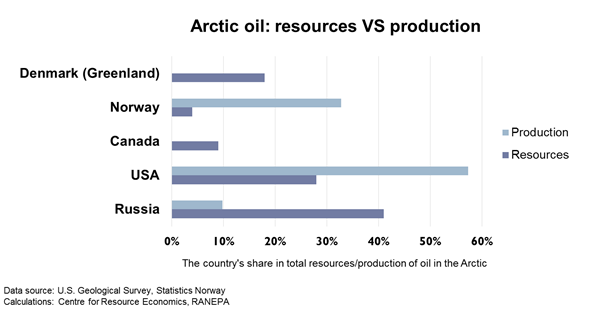 The country’s share in total resources/production of oil in the Arctic. Figure 1.2. 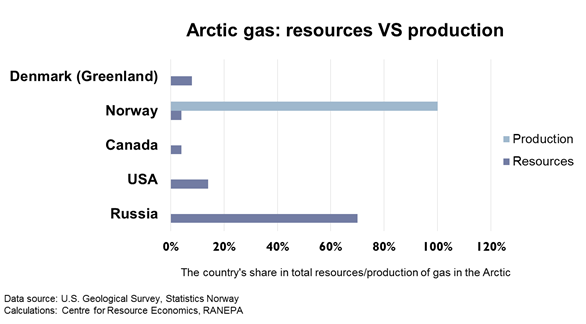 The country’s share in total resources/production of gas in the Arctic. With low oil prices and sanctions against Russia, the future of many Arctic projects is in doubt (particularly those projects that have not yet been launched). Next we consider the main projects on the Arctic shelf (Fig. 2, map of the Arctic). In the tables, we list fields that are at the stage of commercial production or geological exploration. We also look closer at the Russian case as it clearly demonstrates the result of a slowdown in developing Arctic offshore fields. Figure 2. Major current oil and gas projects on the Arctic offshore. In the US, commercial production on the Arctic shelf began in 1987 with the development of the Endicott field and continues to this day. The US produces oil on the shelf of Alaska. Developed fields are located 3-6 miles offshore. These are complicated offshore projects beyond the Arctic Circle. According to the US legislation, territories located beyond 3 nautical miles off the coast qualify as “outer continental shelf” (OCS) (BOEM, 2015). In the US, production is currently being conducted in the Beaufort Sea at the Oooguruk, Nikaitchuq, Northstar, Endicott and Sag Delta North fields. It is possible that their development will continue under the current oil price, as all major capital investments have already been made and now viewed as “sunk costs”. The Liberty field’s status is unclear: no decision on its development has been made so far. Hilcorp Alaska, the new operator of the project, has a plan for its realisation but still has doubts about its profitability (Bailey, 2015). Point McIntyre, Niakuk and Badami fields are only partially located offshore and are being developed from the shore. It is worth noting that there are different views on which Arctic projects can be considered offshore projects. We consider those deposits that are located beyond the Arctic Circle and mostly offshore, and are those developed from offshore (including from islands), not from the mainland. In 1990, the Burger gas field, one of the largest gas fields on the Arctic shelf, was discovered in the Chukchi Sea. However, commercial production in this sea is expected to commence no earlier than 2022 (Offshore Technology, 2015). In 2008, Shell attained a license for exploration in the Chukchi Sea (Shell, 2011). The company conducted seismic studies but the drilling of prospecting wells, planned for 2012, was postponed until 2015. Major current oil and gas projects on the Arctic offshore in the US are listed in Table 1. Table 1. Projects on the Arctic shelf in the US. Norway’s overall oil and gas sector has grown to a considerable size relatively recently (oil production began to make a significant input to the economy only in the early 1980s), but even during this period the country managed to achieve significant results. The first commercial discovery was made in 1969, the Ekofisk field, and two years later the country began to produce oil commercially. At the time of the first discovery of hydrocarbon reserves on the shelf, Norway had no sufficient technology, no qualified specialists and no oil company of its own to develop these resources. The initiative came from foreign companies and the government had to adopt strict measures for the regulation of the industry. Historically, Norway’s oil and gas sector was formed through cooperation with foreign companies and was under partial control of the government, which up to this day participates directly and indirectly in hydrocarbons production. The state company Statoil was founded in 1972. Norway transitioned from considerable state control to moderate state participation in the economy. Today, the share of the state in the economy, including the oil and gas sector, is significantly smaller. Statoil was partially privatised in 2002 and currently does not hold compulsory shares in projects. Norway has led the development of the continental Arctic shelf since 2007 by means of the Snohvit project in the Barents Sea. The Snohvit field and the Albatross satellite field are currently being developed as part of this project with plans to develop the second satellite field Askeladd in the future. The gas produced is transferred to the northernmost LNG factory in the world. The launch of production on another field, Goliat, is planned for the summer of 2015. Its development was already postponed in 2013 and again in 2014 due to increased expenditures and technical problems. Apparently, the development of the Johan Castberg, former Skrugard field, is also postponed: Statoil is considering the possibility of postponing development of the field as a measure to decrease expenditures against the background of low oil prices. Major current oil and gas projects on the Arctic offshore in Norway are listed in Table 2. Table 2. Projects on the Arctic shelf in Norway. The share of the Arctic shelf in the overall Russian resources is very significant. For example, Arctic seas account for about 90% of overall Russia shelf hydrocarbons (Bogoyavlensky, 2012). It is important to note that only those Russian companies with a state participation of more than 50% and five years experience working on the Russian shelf can be awarded subsoil exploration and production licences on the continental shelf of Russia, including the Arctic offshore (Law “On Subsoil”, Clause 9, 2015). The state-controlled giants Gazprom and Rosneft satisfy these conditions. Another state-owned smaller company Zarubezhneft is also a potential licensee; its subsidiary was approved for working on the Arctic shelf. Private companies are only allowed to participate in projects on the Arctic shelf of Russia as part of joint ventures with a share of less than 50%. In Russia, a lot of licenses have been awarded on the Arctic shelf to either Rosneft or Gazprom; however, only one project has so far reached the stage of production. We will look at the main projects below. In Russia, production on the continental Arctic shelf commenced only in late 2013 on the Prirazlomnoye field in the Pechora Sea. By 2020, Gazprom plans to commission the Dolginskoye field in the same sea, although this is now likely to be stalled due to Western sanctions. The development of the giant Shtokman field in the Barents Sea, one of the largest gas condensate fields in the world, was postponed. In January 2015, Gazprom received two more licenses for the Pechora and Barents Seas’ shelf: the Northwestern and Kheisovsky sections. In addition, Gazprom considered the possibility of developing the Northern Vrangel section (the Eastern Siberian and Chukchi Seas) together with a foreign partner. Kara Sea: Eastern Prinovozemelskoye 1, 2 and 3 (including the Pobeda field on the Eastern Prinovozemelskoye 1 section) and Northern Kara sections. Chukchi Sea: Northern Vrangel 1, 2 and South-Chukchi sections. Laptev Sea: Ust-Oleneksky, Ust-Leninsky and Anisinsko-Novosibirsk sections. The realisation of joint projects by Rosneft and Italy’s Eni (Fedynsky and Central Barents sections in the Barents Sea), according to both companies’ statements, will continue in compliance with the sanctions regime. Cooperation of Rosneft and Norway’s Statoil (Perseevsky section in the Barents Sea) has not been formally curtailed, but Statoil aims to fulfil all conditions stipulated by international sanctions yet the question of delivering the necessary equipment for production remains open. Rosneft plans to develop three sections of the shelf in the Barents and Pechora Seas (Western Prinovozemelsky, South Russian and Medynsko-Varandeysky) together with the Chinese company CNPC and two sections in the Pechora Sea (South Russian and Western Matveevsky) together with the Vietnamese company PetroVietnam. In Russia, production in the near-coastal area (bordering the shelf) in the Arctic has been underway since 2003: the Yurkharovskoye field (operator, non-state company Novatek), which is only partially located under water (in the Tazovskaya Guba basin, Kara Sea gulf) and is developed from onshore. This project does not fit the definition of a continental shelf project. Another Russian project in the Arctic is Yamal LNG (liquified natural gas), which is focused Southern Tambey field located on the Northeast of the Yamal peninsula. This project is located onshore and is also excluded from the list of shelf projects. The ownership structure of the Yamal LNG operator is as follows: 60% Novatek (Russia), 20% Total (France) and 20% CNPC (China). Implementation of the project is planned to continue in accordance with the set timeframes despite sanctions. 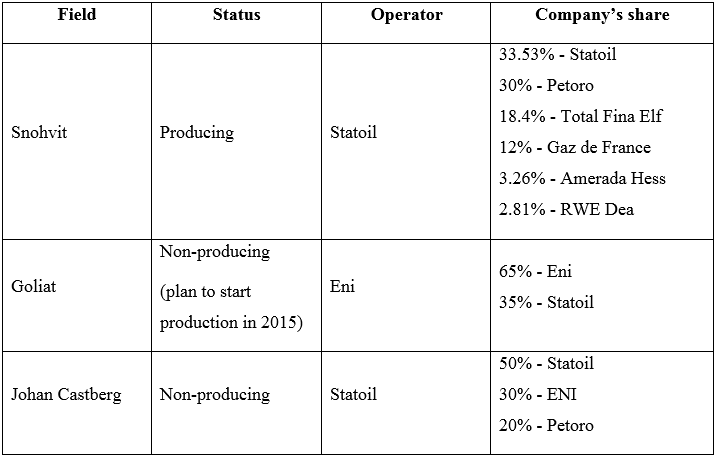 Major current oil and gas projects on the Arctic offshore in Russia are listed in Table 3. Table 3. Projects on the Arctic shelf in Russia. To highlight, in the table above, the share of the state company in the Shtokman project is 100% because the joint venture Shtokman Development AG, where Total has a 25% share, is the operator of the first phase of the project. The operator of the second and third phases is Gazprom Neft Shelf, which is 100% owned by Gazprom. The license owner is Gazprom Neft Shelf, while Shtokman Development AG will be the owner of the infrastructure of the first phase of the project for 25 years from the start of production on the field. Let’s examine in more detail the process of developing the Prirazlomnoye and Shtokman fields, which has been underway for more than 20 years. Their history explains the slow rate of developing the Arctic region of Russia. The Prirazlomnoye field was discovered in 1989 and three years later the project development process was initiated. In 1992, on the decision of the Russian Federation government, the Rosshelf state company for the development of the shelf was founded. Companies linked to the development of the Prirazlomnoye and Shtockman fields were incorporated into it, including Gazprom, which remains its main shareholder. In 1993, Rosshelf gained 25-year licenses on developing these fields. Later these licenses were re-issued to Sevmorneftegaz (today’s Gazprom Neft Shelf) – a joint venture of Gazprom and Rosneft created in 2002 (Rosneft sold its share to Gazprom in December 2004). Construction of the ice-strong sea stationary platform for Prirazlomnoye commenced in December 1995 and was supposed to last three years. However, the work plans kept changing and all deadlines were missed. 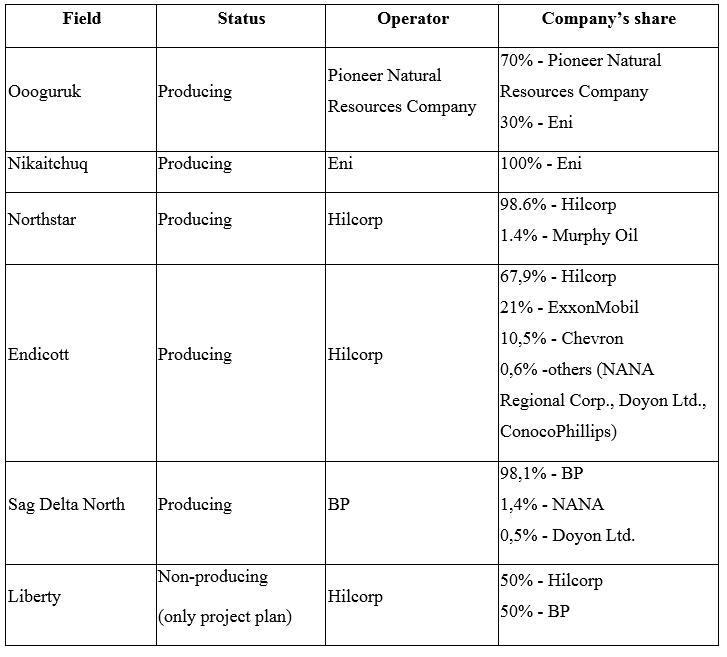 Foreign partners (companies BHP Petroleum and Wintershall) spent their committed funds and exited the project in 1998 and 2002 respectively, failing to gain any revenues. The platform was placed on the field only in 2011 but was not fully ready for exploitation. As a result, total investments into the project increased threefold from the initially estimated amount (Lunden and Fjortoft, 2013). However, the first oil was offloaded only in April 2014. Development of the Shtokman field, discovered in 1988, has also been continuously postponed. Talks with foreign partners began almost immediately after the issue of the license. In 1996, the first framework agreement between Rosshelf (with a 50% share in the consortium) and companies Conoco, Fortum, Norsk-Hydro and Total (which divided the remaining 50% between themselves) was signed. The agreement expired in 2002 with nothing having been achieved. In 2005, Rosneft withdrew from the project. Gazprom’s plans on the development of the field changed repeatedly, the choice of partners and markets also changed (before the shale revolution, the US was supposed to be the main market). In 2004-2005, Gazprom signed memorandums containing offers on realization of joint projects with the largest global energy companies (Chevron, ConocoPhillips, Total, Statoil, and Norsk Hydro were among the potential partners). In 2006, Gazprom announced plans to develop the field alone and to attract foreign companies only as contractors. However, this approach did not satisfy the interests of the latter. In 2008, the choice of partners was agreed upon: Gazprom signed an agreement with Total and Statoil to create a joint venture (special-purpose company), namely Shtokman Development AG (with Gazprom, Total, and Statoil holding respective shares of 51%, 25%, and 24%), which would become the operator of the first phase of the project (while not being a license holder). Foreign companies gained a share in the operator but their role, in essence, was reduced to providing services without holding the license. The project still has not been launched. In 2012, consortium partners in Shtokman Development AG reached an agreement that expenditures were too great and decided to postpone the realisation for an indefinite term (Oliphant, 2012). The same year, Statoil withdrew from the project, having transferred its share to Gazprom. Hence, companies had doubts about the economic prospects of the project even during the period of high oil prices (when the oil price exceeded the benchmark of $100 per barrel). In 2013, Gazprom cancelled the tender on construction of an LNG plant and planned to begin its development no earlier than 2019. It appears now that the development of Shtokman has been postponed for an even longer term, until the oil price rises again and gives prospects for the commercial success of the project. Initially, the Shtokman field was planned to be developed as part of the division of production agreement, but soon almost all production sharing agreements (PSAs) in Russia were cancelled. PSAs remained in force for only two projects: Sakhalin-1 and Sakhalin-2. These two shelf projects are still producing and providing tax contributions to the country’s budget. 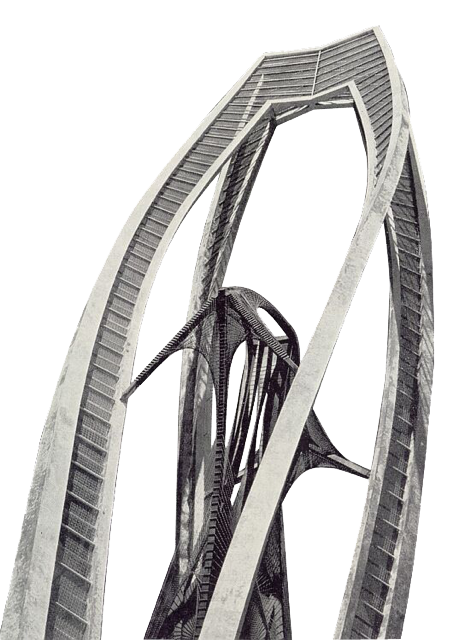 For them, the mechanism of PSA became the basis for success. If Shtokman had been initiated during the period of high oil prices, then its development, most likely, would have continued today. However, due to procrastination and constant changes in rules of the game, the development of the field did not start and it is now unclear if it is going to ever be developed. With today’s prices, it is much more difficult to pay off the very high costs of developing the project. At the moment, Canada does not produce oil and gas on the Arctic shelf, nonetheless it has considerable experience in its geological exploration: the exploration of the Arctic shelf was conducted actively in the 1970s-1980s. Notably, a major part of the geological exploration was conducted by Panarctic Oils, the main shareholder of which was the state (45% share of the federal government in the share capital). During those years, the government pushed for state-led development of the Arctic through this company but there was no production on the shelf. At this point in time, the number of exploration licenses has increased but drilling has not yet resumed. In 2012, an agreement on joint 3D-seismic studies in the Beaufort Sea was signed, however since 2006, not a single well has been drilled. Chevron postponed drilling in the Canadian part of the Beaufort Sea for an undefined term (Milne et al., 2015). The government of Canada considers developing of oil and gas resources on the Arctic shelf an important priority for the future. This however remains a long term prospect. In addition to low oil prices, the development of oil and gas reserves in the Arctic is currently constrained by a number of environmental and legal problems (Henderson and Loe, 2015). Denmark has access to the Arctic shelf through Greenland (an autonomous territory within Denmark). After the drilling in the 1970s and the 1990s, the frenzy of geological exploration on the Arctic shelf in Greenland began in 2010; however, it did not produce any positive results. In 2010-2011, a British company Cairn Energy invested approximately $1 billion into geological exploration and drilled eight test wells, but did not discover any commercial oil reserves. In January 2015, companies Statoil (Norway), Dong Energy (Denmark) and GDFSuez (France) returned most of their exploration licenses for the Arctic shelf of Greenland (Baffin Sea) due to high expenditures and the ambiguity of the volume of potential discoveries under conditions of low oil prices. Despite the fact that Greenland has not yet succeeded in discovering commercial reserves on the Arctic shelf, it has long term ambitions for the development of the region. The state-owned company Nunaoil plans to attract significant investment over the next 20-30 years, as the production of oil and gas in the Arctic can help Greenland become economically independent from Denmark (Wilson Center, 2014). The relative efficiency of private independent companies is demonstrated by the example of the shale revolution in the US. However, the example of the Arctic has been significantly less studied. We think that while analysing the development of the Arctic shelf it is important to pay attention to the structure of the oil and gas sector. The analysis of the projects provided in the tables allows us to make the following conclusions. Russia has the biggest share of state participation in the development of the Arctic shelf: the cumulative share of Gazprom and Rosneft in the five projects reviewed is 80%. The reason is the legislation regarding the development of the continental shelf, providing for the minimal state participation of 50%. In the US, the share of state participation in the development of the Arctic is 0%. The oil and gas sector in the US entirely consists of private companies. The state receives royalties but does not participate directly in the exploration and development of hydrocarbons. All fields on the US Arctic shelf are developed by private companies in the Beaufort Sea. A state company of another country, Norwegian Statoil (Chukchi Sea), has exploration licenses for the US Arctic shelf (Statoil, 2011). In Norway, the state does not have a compulsory share in Arctic projects and participates in the development of the shelf through Statoil and Petoro. Initially, Statoil was a 100% state-owned company and at the time of founding had a 50% share in production licenses on the continental shelf, but later was partially privatised (now the state’s share is 67%). Petoro was created to operate the SDFI mechanism (State’s Direct Financial Interest). SDFI assumes direct participation of the state as an investor: it pays for part of the capital and operational expenditures and receives part of the profits from the sale of oil and gas, proportional to its share in the project. At the moment, the SDFI system is fully controlled by the state company Petoro, previously this function was performed by Statoil. On the Arctic shelf of Norway, the total share of state companies Statoil and Petoro in the three projects reviewed is 56%, that is, there exists almost-equal participation of state and non-state companies. The SDFI mechanism allows companies to share the exceptionally high risks of the Arctic conditions (Petoro has a share in the Snohvit and Johan Castberg projects). Therefore, the state has the highest share in projects on the Arctic shelf in Russia and the lowest in the US (see Table 4). Table 4. The share of state companies in projects on the Arctic shelf in the US, Norway and Russia. Even though in Norway this share is much higher than in the US, Statoil and Petoro are more akin to private companies in their management structure. Despite the fact that Statoil is to a significant extent controlled by the state, it has many features of a private IOC (international oil company). It should be noted that the existing policy framework in the US (access for private companies including foreign ones, lack of a state oil company) has a direct impact on the development of the Arctic, resulting in the US having the highest number of producing projects among countries with access to the Arctic basin. Evidently, active participation of private corporations, including international oil companies, on the Arctic leads to more progress in the development of its resources. As demonstrated by examples in this article, the lesser the state’s share in Arctic projects, the higher the success of the country in the development of the shelf beyond the Arctic Circle. This result can be explained by the more efficient organisation of private companies. The authors’ overall calculations for worldwide oil companies confirm that private companies have higher indicators of economic efficiency and, in particular, indicators of profitability (Fig. 3.1 and 3.2). In 2014, EBITDA per barrel for the six largest private oil companies was 35% higher than for the six largest state-owned oil companies ($35.53 and $26.35 per barrel, respectively), in 2013 it was 48% higher ($45.12 and $30.47 per barrel, respectively). In 2014, net income per barrel for the six largest private companies was 87% higher than for the six largest state-owned companies ($15.28 and $8.19 per barrel, respectively), in 2013 it was 56% higher ($17.35 and $11.12 per barrel, respectively). Figure 3.1. 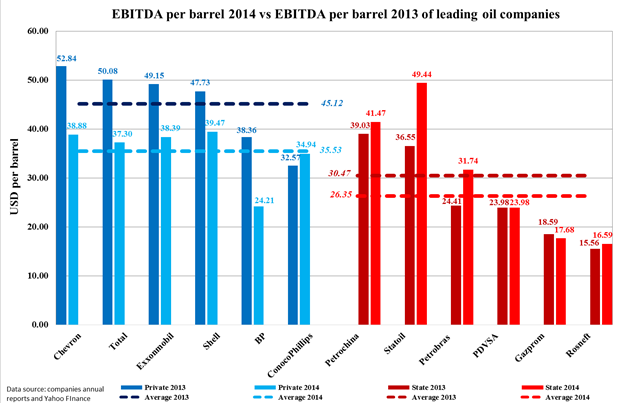 EBITDA per barrel for the 12 largest oil and gas companies*. Figure 3.2. 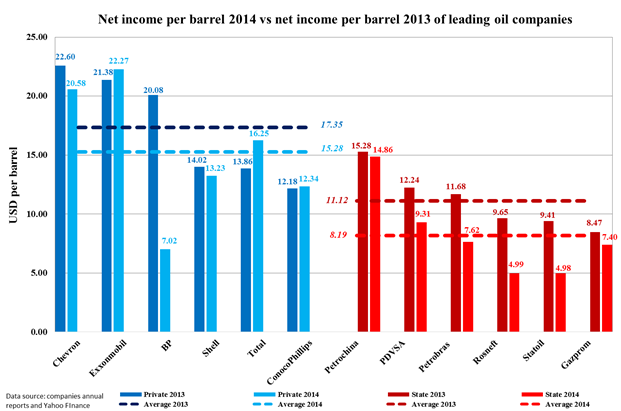 Net income per barrel for the 12 largest oil and gas companies*. *NB: only those companies which produce hydrocarbons above 2 million barrels of oil equivalent per day and that publish annual reports are included in the list. The analysis of global experience brings us to the conclusion that predominantly private corporations, both major vertically integrated oil companies, and medium and junior companies are the main engines of technological progress in the oil and gas sector. It should be noted that the main factor in innovative development is the institutional framework in which specific companies operate. For example, in Russia, as a result of high state participation, worse investment climate and weaker economic and political institutions, the stimuli for private companies are a lot lower than in the US or Norway. In Norway, despite the high share of state participation, the oil and gas sector is defined by high technological development and competitiveness. The shale revolution in the US demonstrated the higher efficiency of private independent innovative companies. Such companies became its driving force. The prominent features of the development of shale deposits are their short production cycle and relatively low expenditures for drilling, due to their small well size compared to traditional deposits. Consequently, production companies can react relatively flexibly to the changing oil price, i.e. quickly complete development of the already drilled wells when the price decreases and quickly begin drilling and increasing production when prices increase again, as this does not require considerable capital investments. The specifics of the development of shale resources defined the structure of this sector: private junior companies were the main drivers of these projects, working in a highly competitive environment. Due to the activities of private companies, the growth in efficiency in shale projects significantly exceeds that in conventional deposits. For now, operational expenditures for the development of shale deposits remain higher than in conventional projects, but it is only a matter of time until costs go down. The Arctic is different in that its oil projects are considerably larger and more expensive than shale ones due to the climate and the geographical peculiarities of the region. Therefore, their development requires both high capital and high operational expenditures. 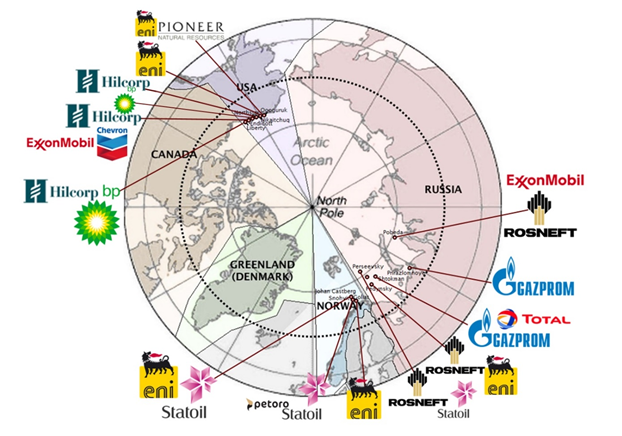 Consequently, when developing the Arctic shelf, strong results can be achieved by vertically integrating oil corporations in partnerships with medium-sized technologically advanced companies. To make it possible, a country must have a developed sector of innovative independent companies with low barriers to entry (Kryukov, 2015). Given the constrains imposed on Arctic exploration by the lower oil price, the involvement of private companies is becoming even more important than before due to their relatively higher efficiency in making investment decisions than that of state oil companies (Conley et al., 2013). As a consequence, the latter might seek more alliances with private companies in the Arctic region (Ebinger et al., 2014; Wilson Center, 2014). Today the Arctic shelf possesses enormous untapped hydrocarbon resources while there are relatively few projects that are at the stage of commercial production. The development of fields on the Arctic shelf requires very sophisticated technology and colossal investments. Under conditions of low oil prices, it is much more difficult to justify high expenditures and high development risks. Many projects, which just recently seemed economically viable, could now prove unprofitable: this relates, first and foremost, to those projects that have yet to enter the production stage (where capital investments have not yet to been made). Among countries in the Arctic basin, only three are carrying out production on the Arctic shelf; the US, Norway and Russia, with most oil produced by the US and gas by Norway. Russia, which has the highest share in Arctic oil and gas resources, has not yet developed its resource potential. In many ways this happened because of access restrictions for private and foreign companies, lack of predictable and reliable regulation and other institutional hurdles. Countries reviewed in this article differ considerably by the proportion of state-owned and private companies’ participation in the development of the Arctic shelf: Russia has the highest share of state participation (80%), and the US has none at all. The outcome of only private companies working in the US and operating in a competitive market, contributes the highest number of operational projects on the Arctic shelf compared to Norway and Russia combined. Analysis of the largest producing companies’ activities indicates that private companies have higher indicators of profitability, which confirms their higher efficiency when compared to state-owned companies. However, the participation of the state in the oil and gas industry can, within reason, nonetheless be relatively efficient and Norway is an example of that. In Norway, the state participates in projects (56%) but does not have a required share; it is actively cooperating with private companies, including foreign ones. The prevalence of private companies in the oil and gas sector generates more results not only in the development of shale and other unconventional hydrocarbons but also in other complicated projects, in particular, projects on the Arctic shelf. Bailey A., 2015. New Liberty plan. Petroleum News 20(2). BP, 2013. BP in Alaska. BP Exploration Alaska Inc, Anchorage, pp. 39. Bogoyavlensky V.I., 2012. Prospects and Problems of the Arctic Shelf Oil and Gas Fields Development. Burenie & Neft 11, 4-9 (in Russian). Bird K.J., Charpentier R.R., Gautier D.L., Houseknecht D.W., Klett T.R., Pitman J.K., Moore T.E., Schenk C.J., Tennyson M.E., Wandrey C.J., 2008. Circum-Arctic Resource Appraisal: Estimates of Undiscovered Oil and Gas North of the Arctic Circle. U.S. Geological Survey (USGS), Fact Sheet 2008-3049, United States, pp. 4. Conley H.A., Pumphrey D.L., Toland T.M., David M., 2013. Arctic Economics in the 21st Century. Center for Strategic & International Studies, Washington D.C., pp. 74. Dlouhy J. A., 2015. Shell planning to restart Arctic drilling this year. Fuelfix Jan.29. Ebinger C., Banks J., Schackmann A., 2014. Offshore Oil and Gas Governance in the Arctic: A Leadership Role for the U.S. Energy Security Initiative, Brookings Institution, Washington D.C., pp. 74. ExxonMobil, 2013. Arctic Leadership. ExxonMobil, Irving, Texas, pp. 34. Harsem O., Eide A., Heen K., 2011. Factors influencing future oil and gas prospects in the Arctic. Energy Policy 39(12), 8037-8045. Henderson J. and Loe J., 2014. The Prospects and Challenges for Arctic Oil Development. Oxford Institute for Energy Studies, Oxford, pp. 60. Kosenkova N.N., Ananyev V.V. 2010. Arctic shelf: «resources for the future». Oil industry 12, 16-19 (in Russian). Kryukov V.A., 2015. Arctic Economy: Focus on Socio-Economic Return. Journal of Siberian Federal University. Humanities and Social Sciences Supplement 8, 21-43 (in Russian). Langhelle O., Blindheim B-T., Oygarden O., 2008. Framing oil and gas in the Arctic from a sustainable development perspective. In: Mikkelsen A. and Langhelle O. (Ed. ), Arctic oil and gas: sustainability at risk, Routledge, New York, pp. 15-44. Law “On Subsoil”, Clause 9, 2015. Law of the Russian Federation N 2395-1 (dated on 21 February 1992, last amended by N 499-FZ 31 December 2014). Russia, pp. 60. Lindholt L. and Glomsrod S., 2011. The role of the Arctic in future global petroleum supply. Statistics Norway, Research Department, Oslo, pp. 35. Lunden L., Fjortoft D., 2013. Twenty years of development, and the oil is still there: Prirazlomnoe – the first agonizing Russian Arctic shelf project. ECO 4, 56-77. Milne R., Adams C., Crooks E., 2015. Oil companies put Arctic projects into deep freeze. Financial Times Feb.5. Oliphant R., 2012. Gazprom Puts Shtokman and Partners on the Shelf. The Moscow Times Aug.30. Shell, 2011. Shell in the Arctic. Royal Dutch Shell, Hague, pp. 7. Statoil, 2011. FACTS North America. Statoil, Stavanger, pp. 13. Wilson Center, 2014. Opportunities and Challenges for Arctic Oil and Gas Development. Eurasia Group report for The Wilson Center, Washington, D.C., pp. 29. The article was published in the “Energy Exploration & Exploitation”, January 2016, vol. 34, no. 1. P. 99-112.